The introduction to this article describes the Himalayan mountain range, while the next chapter outlines its formation. The article then goes on to describe the early use of trigonometric networks in Europe and India, and the important achievements of Sir George Everest. When his successor, A. S. Waugh, extended the trigonometric network to the foot of the Himalayas, he determined the height of the highest peak of Mt. Everest trigonometrically, by measuring vertical angles only in the direction of Mt. Everest. Later, it became possible to determine the height of the highest peak in the world more precisely, using modern surveying means. The peak was named Mt. Everest in 1865, at the proposal of A. S. Waugh. It is known by other names by the indigenousl populations in China and Nepal. Finally, the earliest attempts to climb Mt. 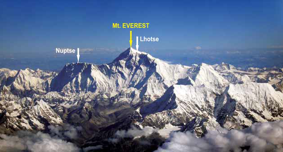 Everest are described.